Are you getting tired of setting up WordPress themes that require a developer to figure everything out and even when you somehow setup the themes, they are hardly usable because of the clunky code and endless number of useless scripts that make your visitors wait a good 3 or 4 seconds before everything’s loaded? So were we. That’s the reason MyThemeShop decided to start MyThemeShop in the first place. Themes from MyThemeShop are not only elegant yet simple, they are also easy to setup and load blazing fast even on the slowest of internet connections. 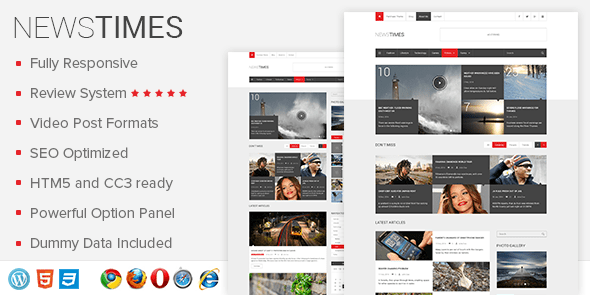 Today, Awesome Theme are proud to announce the additions of a new magazine style theme called NewsTimes to their portfolio of themes. NewsTimes has a pixel perfect design, attractive layout, loads very fast, doesn’t have clunky code and is SEO friendly. Not only that, it has a built in review system for writing helpful reviews of products and it is an ultra-responsive theme that works very well across all devices. MyThemeShop just released this theme and they are running a small promo for the first 100 purchases of the theme. First 100 buyers of this theme can get it for only $9. All you have to do is use “9USDNewsTimes“ coupon code at the checkout screen to avail of this offer. Hurry up though, this offer won’t last long and they will start selling this at the normal price of $35 after 100 purchases. What are you waiting for? Don’t miss this opportunity. You will get access to this link once you have made a purchase.